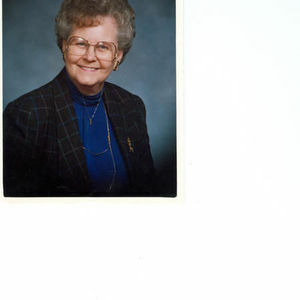 M. Joyce Mitzel, 87, Breckenridge, MN, passed away Sunday, December 23, 2012 at St. Francis Healthcare Campus, Breckenridge, MN. The Funeral Service will be Friday, December 28, 11:00 a.m., at Breckenridge Lutheran Church, Breckenridge, MN. There will be visitation Thursday, from 5 PM to 7 PM at Willow Creek Chapel, Wahpeton and one hour before the service at the church on Friday. Interment will be held at Fairview Memorial Gardens, Wahpeton, at a later date. Vertin-Munson Funeral Home, have been entrusted with the services. Joyce was born Feb. 8, 1925 in Wahpeton, ND, to Julius and Manda (Grinager) Hudson. Joyce graduated from Wahpeton High School and State School of Science. She was united in marriage to Ivan R. Mitzel on October 21, 1943 and the couple moved to Breckenridge, MN, where they raised their two children. Joyce was homemaker and book keeper for Hudson & Mitzel Contractors. In September of 1965 she started working in the office at St. Francis Nursing Home in Breckenridge. She received her administrators' license gradually as she worked up to the positions of office manager, assistant administrator and personnel. Joyce retired from St. Francis in August 1990. After her retirement she spent many years volunteering for St. Francis Auxiliary. Over the years she accumulated over 10, 000 hours; 40 years of service as an employee and volunteer at St. Francis Home. Ivan passed away October 31, 2010; Joyce continued to live in Breckenridge. Joyce is survived by her son and daughter, Ivan Ralph Jr. (Su) Mitzel, Lavon, TX; Shir (Russ) Warner, Tucson, AZ; two grandchildren, Todd (Lisa) Warner Grand Forks ND; Danika Noreen, Grand Forks, ND; four great-grandchildren, Lexy, Hudson, Riley and Conner; one brother-in-law, William (Pat) Mitzel, Kirkland, WA; three sisters-in-law, Agatha Mitzel and Dorothy Mitzel, both of Wahpeton, Pat Mitzel, Fergus Falls, MN, and nieces and nephews. Joyce was preceded in death by her parents, her husband Ivan, and three brothers, Cyril, Clyde and Kenneth Hudson, her brothers and sister-in-law: Leona and James Snider; Floyd, Marvin and Lyle Mitzel. Donations may be made to Breckenridge Lutheran Church or St. Francis Healthcare Campus. The beautiful and interactive Eternal Tribute tells Joyce Joyce's life story the way it deserves to be told in words, pictures and video. Ralph & Shir- So sorry to hear of Great Aunt Joyce's passing. I have many great memories of her when I was growing up. She always had a smile on her face and always knew how to put one on mine. My thoughts and prayers go out to you all. Joyce was so kind and sweet. I worked for her at St. Francis Nursing Home. She taught me many things, she always made you feel so special. She will be missed!! I extend my deepest sympathies to the family of Joyce. I knew her while I worked at SFMC especially when I was in OR. I appreciated her energy, her dedication to everyone (patients and staff) and her sense of humor. One St. Patrick's Day she asked the operator to page me as Colleen O'Leary (my maiden name) and when they wouldn't she went home, called in and asked to speak to me - so they had to page me. Such a character! It makes me smile about all her antics. She will be missed very much! I worked with Joyce at SFMC when she volunteered in Same Day surgery. She was a valued and appreciated person! My sympathies to the family. O Joyce, how do we recount the many events of our time together at St Francis. Though it has been years since seeing each other, good warm memories pop to mind: and the laughs. Good God, no end to the opportunities for that. Your life made a difference. And lucky me, I got in on it!! Your energy lives on! !